The forces that created the majestic Teton mountain range are also the natural hazard that has the potential to do the most damage to our community. While there isn’t a way to predict an earthquake there are things we can do to lessen its impact on our homes, our lives, and some actions we can take during the earthquake to lessen the chance of us being injured. · Develop a home earthquake plan so that you know what to do during and after an earthquake. · Conduct earthquake drills with your family or coworkers. Locate safe spots (e.g., under a sturdy table, desk, bench or a load bearing doorway), and identify danger zones (e.g., near windows, glass, outside doors and walls and anything that could fall, such as lighting fixtures or furniture). · Develop a plan for reuniting all family members after an earthquake occurs. · Choose an out-of-state friend or relative that separated family members can call after the quake to report where they are and how they’re doing. Often times during a disaster you won’t be able to call across the street, but you might be able to call out-of-state. · Keep supplies on hand, including food and water for 96 hours (a normal adult needs at least ½ gallon of water to drink per day), a flashlight with extra batteries, a portable radio, a fire extinguisher, and tools. · Store heavy and breakable objects on low shelves. Weed killers, pesticides, and flammable products should be stored on bottom shelves or in closed cabinets with latches. Chemicals will be less likely to create hazards if they are stored in lower, confined locations. · Secure bookshelves, water heaters, and tall furniture to wall studs. Install latches on all cabinets, and anchor overhead lighting fixtures. Secure items that might fall, such as televisions. · Have a licensed professional install flexible pipe to gas appliances to avoid gas leaks. · Move beds away from windows. · Move or secure hanging objects over beds, couches, and other places where people sit or lie down. · Keep shoes and a flashlight under the bed. Keeping shoes under the bed ensures quick access to prevent cutting feet on glass and reduces the risk that glass could fall into them. · Drop, cover, and hold. Move only as far as necessary to reach a safe place. Most people injured in earthquakes move more than five feet during the shaking. · If indoors, stay there. Many fatalities occur when people run outside, only to be killed by falling debris from collapsing walls. It is safer to stay indoors until the shaking stops and it is safe to exit. When going outdoors, move quickly away from the building to prevent injury from falling debris. Extinguish candles, matches or other open flames in case of gas leaks. · If outdoors, find a spot away from buildings, trees, streetlights, power lines, and overpasses. Drop to the ground and stay there until the shaking stops. · If in a vehicle, pull over at a clear location and stop. Stay in the vehicle with seatbelt fastened until the shaking stops. · Check yourself for injuries. Protect yourself by putting on long pants, a long sleeved shirt, sturdy shoes, and work gloves. · Check others for injuries. Apply first aid if necessary. · Check for gas and water leaks, broken electrical wiring or sewage lines. If there is damage, turn utility off at the source. · Stay away from downed or damaged utility lines. · Turn on a battery operated radio or TV for emergency instructions. · Do not use the telephone unless there is a serious injury or fire. · Be cautious when opening closets and cupboards. Displaced objects may fall when the door is opened. · Be prepared for aftershocks. Each time you feel one DROP, COVER, and HOLD. · If you evacuate, post a message telling family members where you can be found. 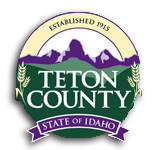 If you have any questions regarding earthquake preparedness please call the Teton County Emergency Management Office at 354-2703.